Rahav and Baruh sighted Vidal, Juhuda and the boys and walked up the sloping street. They greeted their brothers and nephews with the usual kisses on both cheeks—the same as what others were doing as more and more men joined the group. Avram pushed his cart of cloths through the crowd so he could stand with his family. Roffe Michah walked over too. They stood together, waiting nervously with others in the community. A low hum buzzed as more people arrived. The rabbi emerged from inside the synagogue. He was not smiling or showing any signs of joy that the monarchs’ emissary was visiting his synagogue. He had not changed to special clothes, suggesting that this was a surprise visit. He wore his basic brown tunic and a knitted kippa with its frayed brown edges and off-white Star of David in the center. 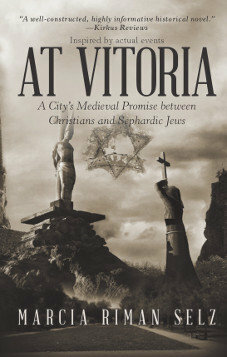 Vidal looked at his nephew but said nothing as the rabbi began to speak.